The butcher has reemerged in American culture as an essential guide in avoiding the evils of industrial meat—which not only tastes bad, but is also bad for one’s health and for the environment. Joshua and Jessica Applestone, a former vegan and vegetarian, are trailblazers in this arena. They owned Fleisher’s, an old-school butcher shop with a modern-day mission—sourcing and selling only grass-fed and organic meat. The Applestones’ return to the nearly lost tradition of the buying and nose-to-tail carving of whole animals—all humanely raised close to their shop in New York’s Hudson Valley—has helped to make them rising stars in the food world. 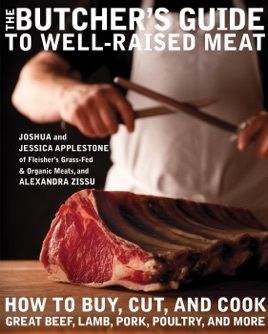 The Butcher’s Guide to Well-Raised Meat is a compendium of their firsthand knowledge. This unique book—a guide, memoir, manifesto, and reference in one—shares everything one needs to know about well-raised meat, including why pastured meats are so much better than conventional ones and how to perfectly butcher and cook them at home. Readers will learn which cut of steak to look for as an alternative to the popular hanger (of which each steer has only one), how to host a driveway pig roast, and even how to break down an entire lamb (or just butterfly the shoulder)—all with accompanying step-by-step photographs. Differences among breeds and ideal cooking methods for various cuts and offal are covered, and the Applestones’ decoding of misleading industry terminology and practices will help consumers make smarter, healthier purchases that can also help change what’s wrong with meat in America today. Complete with color and black-and-white photographs, illustrations, and more than a dozen recipes, The Butcher’s Guide to Well-Raised Meat is the definitive guide to eating great meat—responsibly. Joshua was a vegan and Jessica a vegetarian until they came upon the idea of opening an ethically correct butcher shop. Located in New York's Hudson Valley, Fleisher's Grass-Fed and Organic Meats is their temple to locally raised animals that are hormone-free, and, once properly slaughtered, utilized from nose to tail. When not promoting their business, their first book provides clear, useful instruction on dealing with cuts of beef, lamb, pork, and poultry, interesting meditations on sustainable dining, and a dozen or so recipes thrown in for good measure. The literature of butchery is hard to resist, and the Applestones with Zissu (The Conscious Kitchen) manage to wield both a skillful pen and clever cleaver. Who could not be drawn into an inspection process where they "look for livers the color of oxblood that are rich, smooth and heavy with blood"? Who could not draw back when learning "We also check the eyes of the pigs (whose severed heads come in boxes)"? Handy carving instructions include how to butterfly a leg of lamb and best practices in cutting up a chicken. Short essays reflect upon the benefits of eating a steak proffered from organic cows and the beauty of offal, such as kidneys when they are "glistening' and "firm to the touch." Recipes range from chicken liver p t for humans to beef liver treats for dogs. Enjoyed the easy writing style. Lots of interesting information and tips. Learned quite a bit. Would love to see an even more in depth sequel!